With our success with the GPX™ classical guitar strings, we decided to use our experience with fluorocarbon monofilament to create a series of ukulele strings. Working with a leading ukulele internet forum we have developed two basic sets: bright (UKE 8000 series) or warm (UKE 8100 series). Both sets are available with either a high or low G string (4th string). The high G string is the same fluorocarbon material we use on the other three strings. The low G (4th) has a nylon core with a round wire wrap made of silver plated copper. This is the same material we use to create our Sustenuto™ classical guitar bass strings. The low G plays an octave below the high G.
The first thing you will notice about Oasis Fluorocarbon Ukulele strings is their length (63”). This length is at least twice as long as the length needed to string a concert, soprano or tenor ukulele. We recommend that before using the string you cut the string in half with scissors. Use one section immediately and put one length of the string back in the envelope for future use. If you happen to have a low G set, the low G (4th) has two individual 39” lengths of the wound string in one envelope. Do not cut these strings before use. All round wound strings are subject to “string squeak”. Some players can control this effect better than others. 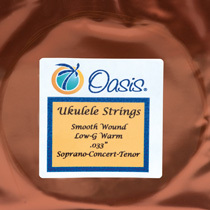 If you are interested in dramatically reducing string squeak, Oasis has developed a smooth wound Low G string made from a nylon core and with a semi-flat wound phosphor bronze wrap wire. Unlike a flat wound string, which is made from flat wire, the semi-flat wound string starts as round wound and is then compressed. Sometimes this is referred to as roller wound. 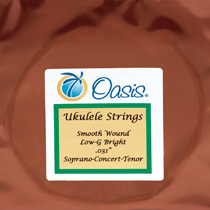 Smooth wound low G strings are available either as an individual string UKE-4SB (.031”) or UKE-4SW (.033”) or as part of a 4 string double set (UKE-8001SB Bright) or (UKE-8101SW warm) The low G smooth wound 4th string will give your ukulele a beautiful mellow tone with minimal or no string squeak. Like the regular low G sets, the two new sets have the same first three 63” strings and two of the 40” warm or bright smooth wound low G strings. 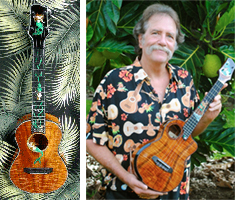 Chuck Moore of Moore Bettah Ukuleles makes some of the most sought after ukuleles in the world. They are truly works of art! 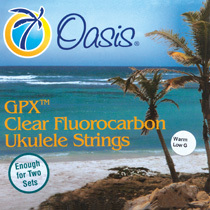 Needless to say, we are more than pleased that he will be using Oasis ukulele strings on most of his production.